There are times when we all long for comfort food which can be fixed in a jiffy. You look into your fridge and you find some leftover steamed rice and you are in no mood to make a curry or even a simple dal. Then you look into your vegetable crisper and lo and behold you have some vegetables… a few shallots, a quarter cabbage, may be some carrots and capsicum staring at you! 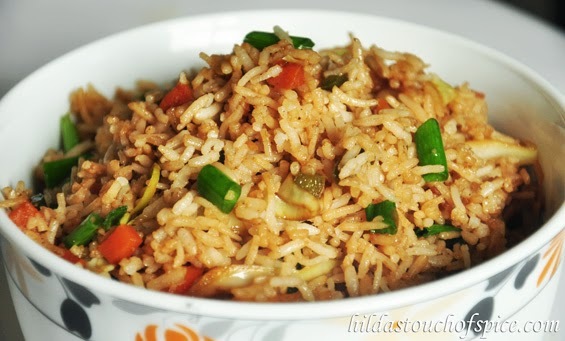 The first thought that comes to my mind when I am too lazy to fix an elaborate meal and want some comfort food is Fried Rice. Voila! Within minutes it is ready and I am very thrilled that there are no leftovers. This means there is no clutter in the fridge & it is time to replenish with fresh stock. Add carrots, cabbage, capsicum, shallots, sugar & stir-fry briefly. Add the cooked, cool rice and toss for a few seconds. Add soya sauce, rice vinegar and toss again on high heat. Reduce heat to medium. Add salt and pepper to taste. Stir well. Taste to check seasoning. Serve piping hot garnished with spring onion greens.